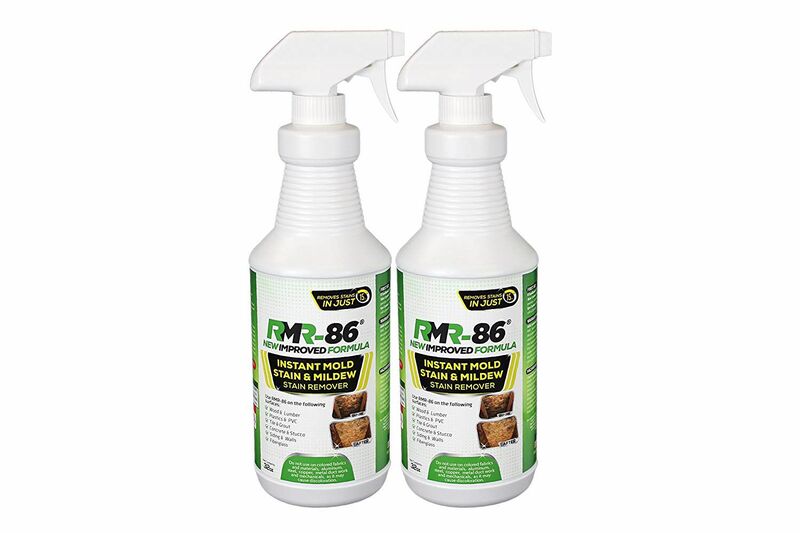 Hundreds of customers sing the praises of this mold and mildew stain remover from RMR-86. It works on nearly any surface, including wood, fiberglass, concrete, and tile, and it promises to remove unsightly stains in 15 seconds, without the need for any scrubbing except in the case of the toughest stains. It’s a bleach-based cleaner, and it promises to be five times stronger than other brands. There are plenty of before-and-after pictures attached to customer reviews so you can see for yourself how well this product works. Customers say that RMR-86 works on the toughest jobs (black mold), but warn that the smell can be strong so you should wear a protective mask and work in a well ventilated area. If you don't have proper ventilation in your bathroom, excess moisture can lead to mold growth in your shower. To remove (and prevent) the buildup of mold and mildew, Skylarlife Mold & Mildew Remover Gel will get deep into the cracks and crevices for a deep clean that will last. It’s a gel, so it doesn’t run down the walls like some liquid versions, and the thick formula is easy to apply thanks to the precise applicator tip. To use, apply it to a dry area and then rinse it off after five or six hours. For tough stains, you may need to repeat this process. Keep in mind that the formula is strong, so you’ll need to wear rubber gloves and work in a well ventilated area. Customers say they can see results almost immediately, and there's no need for scrubbing. While the bottle is on the smaller side, it produces amazing results. For a tried-and-true mold remover for your bathroom, there’s the Tilex Mold and Mildew Remover Spray from Clorox. It removes stains and kills mold and other bacteria like staph, strep, and the fungus that causes athlete’s foot. It’s safe for most surfaces, including tile, grout, vinyl, and plastic, but should not be used on wood, paint, or fabric. It’s the go-to bathroom cleaner for many people who say it’s easy to use and effective. Customers say it's taken out even the toughest mold with ease and leaves their bathroom gleaming. Some note, however, that the smell can be strong, so make sure you have enough ventilation when using it. Mold on your clothes? Unfortunately, it can happen, and when it does this mold remover from Micro Balance Health Products can help take it right out. The formula is all-natural, so it's free of harmful chemicals that can irritate sensitive skin. In place of chemicals, EC3 relies on tea tree oil, citrus seed oil, and tangerine oil, which all work to sanitize and clean. You can add it to every load of laundry and it's safe for fabrics that can be washed with normal detergent. Not only does it eliminate mold spores, musty odor, and bacteria from your garments, it can even keep your washing machine clean too! The majority of customers say it works exceptionally well, and it left their clothes smelling fresh and clean, even when other detergents didn't. Some customers went so far as to say that after finding out they were living with toxic mold, this cleaner saved them having to throw out all their clothes. If you’ve got mold on your leather car seats or other leather surfaces, finding a safe cleaner can be a challenge. This one from 303 Products, however, is up for the job. It doesn’t use bleach but does promise to remove residue and spots left by mold and mildew and it will keep mold from returning You just spray it on, then wipe the surface clean. Note that the leather does have to be sealed and be able to withstand being dampened for this to be safe. Before using this on a large area, you may want to try it on an inconspicuous spot and see how the leather reacts. Customers say it’s easy to use, and they like that it works well on a variety of surfaces. To use, apply the liquid and let it dry for several minutes. Then use a cloth or brush to wipe away any mold. You can also apply another layer to keep mold from returning. Many customers say it gets rid of mold, and not just the stains, better than any other product on the market. They say it works on boats, decks, attics, and more. When you’ve got mold on your concrete and you need something tough to remove it, try this cleaner from Wet & Forget. Just like the name says, use the formula to wet the affected area and then forget it—no need for pressure washing, scrubbing or even rinsing. Beyond concrete, it’s safe for most outdoor surfaces, and as long as you use it as directed it shouldn’t harm your surrounding grass or plants. When you want something tough enough to kill mold, but still want something safe for your family, there’s this surface cleaner from CleanSmart. While it kills 99.9 percent of germs, including mold, it doesn’t contain bleach or any other strong chemicals. The scent is mild, and the cleaner leaves no chemical residue. In fact, it turns into saline water once it has done its job. Customers say it’s a great all-purpose cleaner that can be used on everything from showers to medical equipment. While you may need something a bit stronger to tackle the toughest mold jobs, for battling it on a day-to-day basis, this is a good, non-toxic option. Our writers spent 5 hours researching the most popular mold removers on the market. Before making their final recommendations, they considered 25 different mold removers overall, screened options from 20 different brands and manufacturers, read over 150 user reviews (both positive and negative) and tested 1 of the mold removers themselves. All of this research adds up to recommendations you can trust.